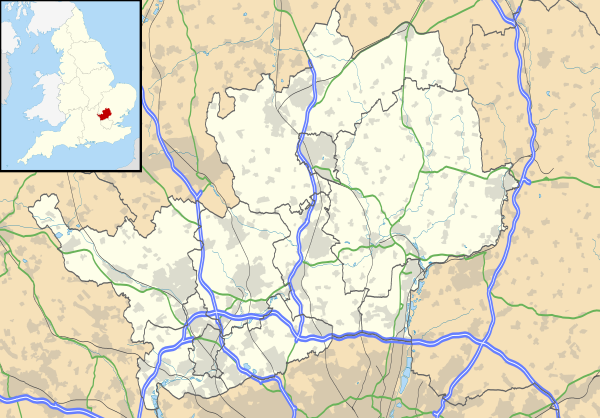 Hertfordshire (/ˈhɑːrtfərdʃɪər/ ( listen); often abbreviated Herts) is one of the home counties in England. It is bordered by Bedfordshire and Cambridgeshire to the north, Essex to the east, Greater London to the south, and Buckinghamshire to the west. For government statistical purposes, it is placed in the East of England region. In 2013, the county had a population of 1,140,700 in an area of 634 square miles (1,640 km2). The four towns that have between 50,000 and 100,000 residents are Hemel Hempstead, Stevenage, Watford and St Albans. Hertford, once the main market town for the medieval agricultural county, derives its name from a hart (stag) and a ford, used as the components of the county's coat of arms and flag. Elevations are high for the region in the north and west. These reach over 800 feet (240 m) in the western projection around Tring which is in the Chilterns. The county's borders are approximately the watersheds of the Colne and Lea; both flowing to the south; each accompanied by a canal. Hertfordshire's undeveloped land is mainly agricultural and much is protected by green belt. The county's landmarks span many centuries, ranging from the Six Hills in the new town of Stevenage built by local inhabitants during the Roman period, to Leavesden Film Studios. The volume of intact medieval and Tudor buildings surpasses London, in places in well-preserved conservation areas, especially in St Albans which includes some remains of Verulamium, the town where in the 3rd century an early recorded British martyrdom took place. Saint Alban, a Romano-British soldier, took the place of a Christian priest and was beheaded on Holywell Hill. His martyr's cross of a yellow saltire on a blue field is reflected in the flag and coat of arms of Hertfordshire. Following the Roman conquest of Britain in AD 43, the aboriginal Catuvellauni quickly submitted and adapted to the Roman life; resulting in the development of several new towns, including Verulamium (St Albans) where in c. 293 the first recorded British martyrdom is traditionally believed to have taken place. Saint Alban, a Romano-British soldier, took the place of a Christian priest and was beheaded on Holywell Hill. His martyr's cross of a yellow saltire on a blue field is reflected in the flag and coat of arms of Hertfordshire as the yellow field to the stag or Hart representing the county. He is the Patron Saint of Hertfordshire. A century later, William of Normandy received the surrender of the surviving senior English Lords and Clergy at Berkhamsted, resulting in a new Anglicised title of William the Conqueror before embarking on an uncontested entry into London and his coronation at Westminster. Hertfordshire was used for some of the new Norman castles at Bishop's Stortford, and at King's Langley, a staging post between London and the royal residence of Berkhamsted. From the 1920s until the late 1980s, the town of Borehamwood was home to one of the major British film studio complexes, including the MGM-British Studios. Many well-known films were made here including the first three Star Wars movies (IV, V, & VI). The studios generally used the name of Elstree. American director Stanley Kubrick not only used to shoot in those studios but also lived in the area until his death. Big Brother UK and Who Wants To Be A Millionaire? have been filmed there. EastEnders is filmed at Elstree. Hertfordshire has seen development at Warner Bros. Studios, Leavesden; the Harry Potter series was filmed here and the 1995 James Bond film GoldenEye. Much of the county is given over to agriculture. One product, now largely defunct, was water-cress, based in Hemel Hempstead and Berkhamsted supported by reliable, clean chalk rivers. Hertfordshire affords habitat for a variety of flora and fauna. One bird common in the shire is the Hooded Crow, the old name of which is the eponymous name of the regional newspaper, the Royston Crow published in Royston. Hertfordshire has headquarters of many large well-known UK companies. Hemel Hempstead is home to DSG International. Welwyn Garden City hosts Tesco, as well as Roche UK's headquarters (subsidiary of the Swiss pharmaceutical firm Hoffman-La Roche) and Cereal Partners production facilities, Pure the DAB radio maker is based in Kings Langley. JD Wetherspoon is in Watford. Skanska is in Rickmansworth, GlaxoSmithKline has plants in Ware and Stevenage. 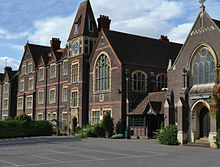 Hatfield used to be connected with the aircraft industry, as it was where de Havilland developed the world's first commercial jet liner, the Comet. Now the site is a business park and new campus for the University of Hertfordshire. This major new employment site is home to, among others, EE, Computacenter and Ocado. A subsidiary of BAE Systems, Airbus and Finmeccanica in Stevenage, MBDA, develops missiles. In the same town Airbus (Defence & Space Division) produces satellites. The National Pharmacy Association (NPA), the trade association for all of the UK's community pharmacies, is based in St Albans. Warner Bros. also owns and runs Warner Studios in Leavesden. As of the 2018-19 season, there are three professional football teams in Hertfordshire: Arsenal W.F.C., Stevenage F.C., and Watford F.C..
Arsenal W.F.C. play at Meadow Park alongside Conference Premier side Boreham Wood, in Borehamwood, Hertfordshire. The club was formed in 1987 and have played in the FA Women's Super League since its inaugural season in 2011. Stevenage F.C. have played at the Lamex Stadium since 1980. Stevenage was the first club to win a competitive match at the new Wembley Stadium, beating Kidderminster Harriers 2-3 in the 2007 FA Trophy Final. The club currently play in the EFL League Two and have been managed by former player Dino Maamria since March 2018. Watford F.C. play their home games at Vicarage road, where the club has played since 1922. The club joined the football league in 1920 as a founding member of the third division and first played in the First Division of English football in 1982. Watford have played in the Premier League since their promotion from the EFL Championship following the 2014-15 season. There are several semi-professional and amateur football clubs in Hertfordshire. Most notable amongst these are Borehamwood F.C. who play in the Conference Premier, the fifth tier of English football, and Hemel Hempstead Town F.C. and St Albans City F.C. who both play in the National League South, part of the sixth tier of English football. Hemel Stags are a rugby league team based in Hemel Hempstead. Hemel Stags have played at Pennine Way Stadium since the club's founding in 1981. The club plays in league 1, the third tier of the British rugby league system. The Hertfordshire Rugby Football Union is the governing body for rugby union in Hertfordshire; responsible for any interested parties involved in rugby. Tring Rugby play matches at Cow Lane, Tring. The first XV currently play in the London & South East Premier, a level 4 league. Hertfordshire is a home county with many towns forming part of the London commuter belt and has some of the principal roads in England including the A1, A1(M), A41, A414, M1, M11, and the M25. Stansted Airport and Luton Airport are both within 10 miles (16 km) of the county's borders. The commercial airfield at Elstree is for light aircraft. The Grand Union Canal passes through Rickmansworth, Watford, Hemel Hempstead, Berkhamsted and Tring. Jane Austen's novel Pride and Prejudice is primarily set in Hertfordshire. The location of Mr Jarndyce's Bleak House in Charles Dickens's Bleak House is near St Albans. The eponymous residence in E. M. Forster's novel Howards End was based on Rooks Nest House just outside Stevenage. George Orwell based Animal Farm on Wallington, Hertfordshire where he lived between 1936 and 1940. Manor Farm and The Great Barn both feature in the novel. ^ "Resident Population". Hertfordshire Local Information System. Archived from the original on 15 July 2015. Retrieved 10 February 2015. ^ "Area Measurements". Hertfordshire Local Information System. Archived from the original on 10 February 2015. Retrieved 10 February 2015. ^ "Zeppelin Raids - Herts at War". www.hertsatwar.co.uk. Archived from the original on 28 February 2017. Retrieved 23 January 2017. ^ "Leavesden Studios". Film London. Archived from the original on 7 August 2007. Retrieved 4 November 2018. ^ "Hatfield train crash remembered". BBC News. 17 October 2010. Archived from the original on 2 August 2018. Retrieved 2 August 2018. ^ Lewis, Katy (11 December 2015). "'I thought a plane had landed on us'". BBC News. Archived from the original on 2 August 2018. Retrieved 2 August 2018. ^ Staff and agencies (11 December 2005). "Fuel depot blaze 'will last for days'". the Guardian. Archived from the original on 2 August 2018. Retrieved 2 August 2018. ^ "Buncefield blast companies sentenced to pay £9m". The Independent. Archived from the original on 2 August 2018. Retrieved 2 August 2018. 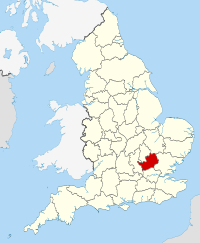 ^ "The East of England". East of England Local Government Association. Archived from the original on 27 January 2012. Retrieved 23 January 2012. ^ "About the chalk mines". Dacorum Borough Council. 2008. Archived from the original on 12 December 2008. Retrieved 7 February 2009. ^ "Sir Hugh Myddleton New River". Intriguing History. 25 April 2015. Archived from the original on 17 June 2018. Retrieved 17 June 2018. ^ Hassan, Jafar. "UK Quality of Life Index". uSwitch. Archived from the original on 6 October 2014. Retrieved 14 November 2013. ^ Regional Gross Value Added Archived 1 December 2007 at the Wayback Machine, Office for National Statistics, pp. 240–253. ^ DigitalFC. "Meadow Park, home to Boreham Wood, Arsenal Ladies, Arsenal Development - Football Ground Map". www.footballgroundmap.com. Archived from the original on 2 August 2018. Retrieved 2 August 2018. ^ Conn, David (7 April 2011). "Women's Super League aims to step out of men's shadow | David Conn". the Guardian. Archived from the original on 3 August 2018. Retrieved 2 August 2018. ^ "The Lamex Stadium - Stevenage Football Club". www.stevenagefc.com. Archived from the original on 2 August 2018. Retrieved 2 August 2018. ^ "Kidderminster 2-3 Stevenage". 12 May 2007. Archived from the original on 13 September 2007. Retrieved 2 August 2018. ^ "Dino Maamria: Stevenage appoint Nuneaton Town boss as manager". BBC Sport. 20 March 2018. Archived from the original on 29 September 2018. Retrieved 2 August 2018. ^ "Vicarage Road - Watford - The Stadium Guide". www.stadiumguide.com. Archived from the original on 2 August 2018. Retrieved 2 August 2018. ^ a b "Watford Football Club archive 1881-2017". www.watfordfcarchive.com. Archived from the original on 2 August 2018. Retrieved 2 August 2018. ^ Smith, Alex (25 April 2015). "Watford promoted to Premier League". ISSN 0307-1235. Archived from the original on 15 July 2018. Retrieved 2 August 2018. ^ Whaling, James (25 April 2015). "Promotions and relegations in the Football League". mirror. Archived from the original on 2 August 2018. Retrieved 2 August 2018. ^ "Watford look set for their fifth manager inside a year after making an approach for Quique Flores". The Independent. Archived from the original on 2 August 2018. Retrieved 2 August 2018. ^ "Rugby League Clubs Hertfordshire | Rugby League Club | Welwyn Garden City, Watford, Ware, Waltham Cross, Stevenage, Royston, Rickmansworth, Tring, Letchworth, Hoddesdon, Hitchin, Hertford, Hemel Hempstead, Hatfield, Borehamwood, Bishops Stortford, Baldock". www.rugbyclubs.info. Archived from the original on 3 August 2018. Retrieved 3 August 2018. ^ "Find Us - Hemel Stags - Rugby League Team". Hemel Stags. Archived from the original on 3 August 2018. Retrieved 3 August 2018. ^ "World famous Bradford Bulls are on their way to Pennine Way this Sunday". Archived from the original on 3 August 2018. Retrieved 3 August 2018. ^ "National League Division One Table - Rugby Union". BBC Sport. Archived from the original on 2 September 2018. Retrieved 3 August 2018. ^ "Hertfordshire Rugby Football Union - News - Fullerians RFC". www.fullerians.co.uk. Archived from the original on 3 August 2018. Retrieved 3 August 2018. ^ Caminsky, Spencer. "Area Guide: Scenery, culture and a manageable commute, Tring has it all". Herts Advertiser. Archived from the original on 3 August 2018. Retrieved 3 August 2018. ^ "London & SE Division". RFU. Archived from the original on 13 July 2017. Retrieved 3 August 2018. ^ "Pride and Prejudice - the Hertford connection". Our Hertford and Ware. Archived from the original on 2 August 2018. Retrieved 2 August 2018. ^ "Charles Dickens". Herts Memories. Archived from the original on 2 August 2018. Retrieved 2 August 2018. ^ Forster, E. M. (Edward Morgan) (1 November 2001). "Howards End" – via Project Gutenberg. ^ "At the gates of Animal Farm". Telegraph. Archived from the original on 2 August 2018. Retrieved 2 August 2018. ^ "Over the road from Animal Farm". The Independent. Archived from the original on 2 August 2018. Retrieved 2 August 2018. ^ "All villages are equal". the Guardian. 24 May 1999. Archived from the original on 2 August 2018. Retrieved 2 August 2018.